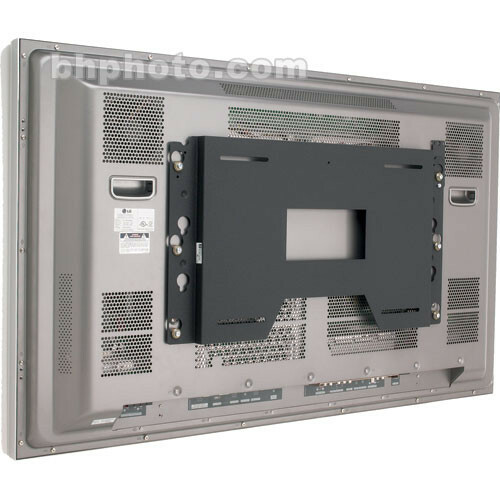 The Chief PSM-2056 is a custom, one-piece bracket that provides an ultra-low profile fixed wall mount solution for flat panel plasma and LCD displays up to 65" or 175 lbs. Seismic rated and UL-listed, the PSM-2056 uses Chief's Q-Latch Mounting System for easy and secure installation. It uses a lockable latch to safely secure display to the mount. Provides quick display connect/disconnect and is compatible with multiple accessories. Unique, one-piece custom bracket design cuts installation time and provides the slimmest fit possible. Mounts to 16" on-center studs (most 60"+ displays include 24" on-center stud pattern). Low profile (1" standard mount depth may vary) mount designed to meet manufacturer requirements for more/less airspace. Display installs in landscape view only. Seismic rated for safer installations. The mount has been evaluated and certified as safe to use in locations where there might be significant seismic activity. Made of sturdy steel construction, the mount uses more surface area for balance and stability. Box Dimensions (LxWxH) 20.25 x 20.0 x 2.75"